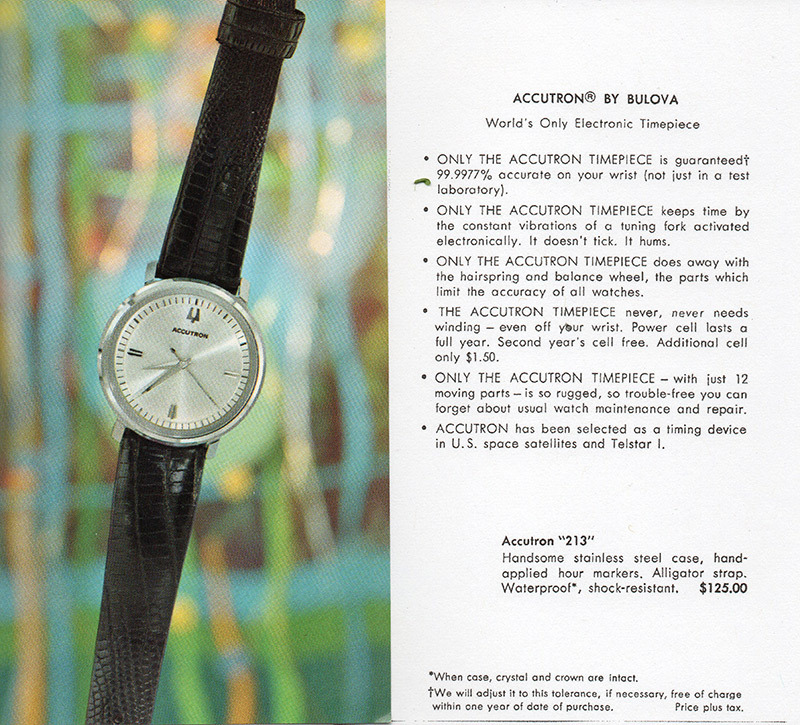 Bulova 1968 Accutron SpaceView "G"
The case back has #2446 printed inside, but that does not match with the appearance of the watch case and with the crystal installed. The 2446 case has rounded, convex sides while this particular watch's sides are flat, and the 2446 uses a smaller crystal (A1254EW). If this is indeed a case #2528 with a #2446 case back, this would make my watch a factory Spaceview (G). If this is instead a case #2600 which is identical and uses the same exact crystal (1270AWS) as the #2528, this model would be a conversion. After closer inspection, it looks like the reflector is genuine and installed properly...so I feel I should only have the wrong case-back. Would love some input as I'm trying to figure out the story of my watch. I can't help with the accuracy of the case parts, but from a model ID point of view your watch certainly presesnts with all the corrcet parts to make it a 1968 Buloiva Accutron Spaceview. Thank you very much for your help! Is there an online resource to check model ID and serial numbers? I'm really going down the rabbit hole with the Accutron passion and would love to learn more and have the right resources as I go. Notice the flared ridge around the bezel of the 2446; does your case have this? The 2528 has a larger opening inside to accept the reflector and dial. Andersok, thanks so much for providing these images. I snapped a few more photos but it appears to me that my case is the one on the right, 2528. The only discrepancy with the photos seems to be in the lugs design. Mine resemble more the 2446 from these photos. I also read somewhere that sometimes the design of the lugs shifted slightly through different production year and manufacturing facilities...so maybe that's why. If your watch case matches the 2528 as Ken illustrates above, it would appear in theory you are correct about a replaced or mis-stamped back. I say that with a grain of salt, as I don't know if all 3 cases you reference have the same back diameter to make them interchangable. Movement and caseback match by date stamp. I would venture the observation that, as the interior case numbers on these are ink stamped that it's possible they (back set) all used the same caseback and the stamp is for repair parts identification purposes? In that line of thinking, it's possible the back was mis-stamped in the factory, or overrun used on the next production line. I would think the s/n would also come into play. Just a logic based thought, as Accutrons aren't my strong point and I'm still learning them. Drawing on my OCD tendencies, it seems unlikely that someone would go through the trouble to convert a 2600 to a Spaceview using correct parts and then use the back from a second non-Spaceview watch without removing the ink stamp to finish the illusion. Watch certainly does present as a correct 1968 Spaceview G.
It is also kind of OCD to think that someone went and found a case-back to replace the original one, but with a correct M9 incision to match the movement inside. And as you said, didn't bother removing the ink stamp with the wrong code. It's fun to speculate on how these beauties came to be. I'd like to hear all the stories these vintage watches could tell. Not being the resident expert on Accutron and the cases they used it seems possible that at some point the case back was replaced. I see no reason it's not possible. In terms of a proper ID I'm not sure we can ever determine that this was a factory Spaceview but it certainly is a Spaceview today. I'm good with Spaceview G, (noting possibility of back replacement with matching date stamp) unless someone has verified data indicating otherwise.